The aim of determining optimum bottom bracket height is either to minimise frontal area or to maximise comfort. The former defers to speed and excitement, the latter to age and wisdom. 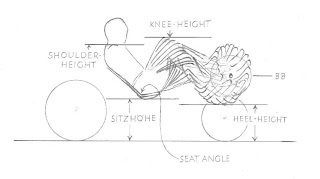 Therefore one approach is to place the BB at the height where the knees rise above the shoulder by the same amount that the heels dip below the sitzhohe. (We have discussed sitzhohe.) For me this is 9 inches above the sitzhohe; it does not mean it is 9 inches for everyone else. Another approach is to remove the head, which gives a reduced frontal area of 0.41 square feet, though since a crash helmet would not then be required, the benefit would be larger. Anyone who performs the experiment is invited to tell us all what speed gain results. An additional benefit is reduced mass, which, without disassembly, can be estimated by filling a bucket with water, weighing it, displacing a volume of water equal to the volume of one's head, and re-weighing the bucket. Experimental error lies in the neglect of the volume of air contained behind the nose but it's about 6 lbs. 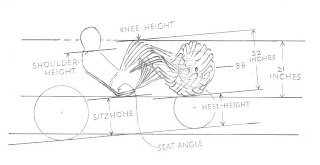 A third approach is to raise the bottom bracket a little more so that the highest point is the knee-toe line, and then, in my case at least, the lowest point becomes, conveniently, the heel-sitzhohe line. In our present example, the BB then becomes 9.5 inches above the sitzhohe, and the frontal area (neglecting the head area which is also reduced by this procedure, though not by as much as decapitation) is reduced by about 5%. One can see where one is going by peeping between one's knees and toes. This is all very well until a fairing is made, whereupon one sacrifices a bit of frontal area for the considerable benefit of being able to see where one is going.